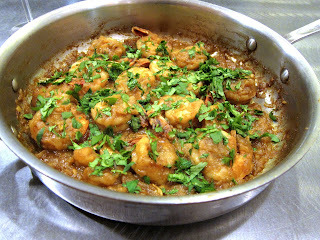 This is a dish that has become a perennial favorite of ours as it is simply bursting with sweet, sour, and salty notes as well as a superbly refreshing aroma and complexity, stemming from the deeply caramelized onions, garlic, and ginger, to the chopped cilantro and lime juice that is added once the dish is complete. Basmati rice would perfectly complement this succulent shrimp dish as would a nice chilled glass of New Zealand Sauvignon Blanc or Alsatian Gewürztraminer. Enjoy! 1. Heat oil in a hot pan on med-high heat. Once pan is hot, add onion until it starts to brown. Season with salt and pepper. 2. Add minced ginger and garlic, cardamom, cloves, and curry powder, and cook this mixture on med-low heat until onions become fully caramelized with a deep brown color. 3. Once onions are fully caramelized, add white wine, return heat to medium-high, and allow the wine to reduce by half. 4. Season shrimp with salt and pepper on both sides and then add to pan. Cover with lid and allow shrimp to simmer in the sauce until they are fully cooked. 5. Add lime juice to taste, sprinkle with cilantro, and serve!